This bicycle voyage of discovery starts in Kipling’s Mandalay on the Irawaddy River and follows near empty roads. We travel at ground level through small villages stopping at local teashops, meeting the locals along the way. In Mandalay we visit the ancient cities of Ava and Mingun before riding alongside the Irawaddy River to Bagan. Spend a morning cycling among the thousands of pagodas, stupas, and temples that dominate a river valley. From Bagan we ride to Mount Popa to visit the hill top temple, before riding into the cool Shan hills. This is a touring trip for mountain bikers and road cyclists. 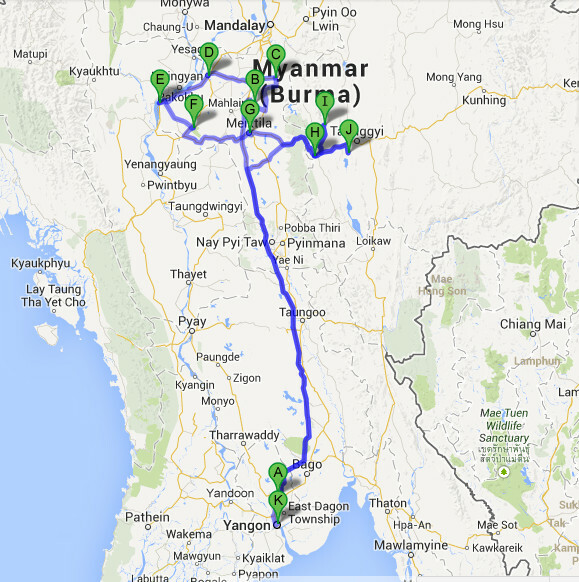 We ride point to point through central Myanmar, covering just over 700 kilometres. Most rides are on country lanes with almost zero traffic. Rest days are in Bagan and at Inle Lake as well as time out of the saddle in Mandalay and Rangoon. The first few days riding are in the flat Irawaddy basin. The second phase of the tour takes us east into mountainous Shan State where there are some climbs, including the challenging but optional 20-km accent on Kalaw Hill. As we ride along major arteries, riders can find their own pace and meet up at prearranged points along the way. The range of surfaces and incredible variety of rides on this tour will ensure that every kind of cyclist is satisfied, whilst the first-class support makes this tour popular with inexperienced and non-riders. Take a boat trip in the morning to Mingun, one of the ancient cities up the IrrawaddyRiver from Mandalay. Return in time for lunch and a swim in the pool. In the afternoon, a short ride around Mandalay finishing with a climb up Mandalay hill.